The Music Department at Christ’s is led by Mr Philip Wilson, Director of Music. We aim to nurture and encourage musical talent in all fields of music; we aim to enrich young peoples’ lives through performance and composition; we aim to prepare young people for life beyond Christ’s and to develop their general cultural awareness; we aim to develop creative skills which will bring about self-confidence and maturity, as well as the increasing ability to work collaboratively with others. We aim to provide performance platforms and to act as ambassadors for the school. We aim to communicate that interaction with music is a fruitful and beneficial activity for all people. There is a strong musical life at Christ's School, with opportunities abounding for a broad range of music making at all levels. The state-of-the-art facilities were opened by Sir Tim Rice in 2004, and the present Director of Music, Mr. Philip Wilson, has been at Christ's since 2005, a period which has seen expansion in all areas, the development of new schemes of work, consistently good GCSE results, increasing numbers learning instruments, more extra-curricular opportunities and more music events. Christ's has excellent music technology facilities – a state-of-the-art purpose-built studio with a suite of Apple Mac computers running Logic Pro X and Sibelius software, as well as a good selection of high quality microphones for various purposes and other audio equipment. Students often use the equipment during lunch break and after school, learning to record their own music, as well as using the technology as a tool for composition. Through taking responsibility for sound, lighting and stage management for musical and other events at school, pupils can, under the guidance of the Director of Music, develop invaluable skills in the technical side of productions. 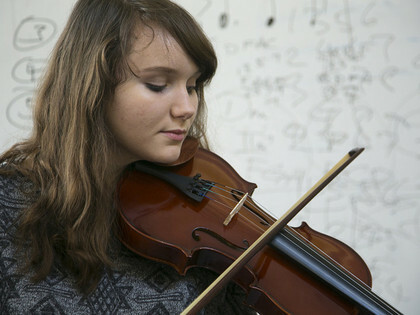 At Christ’s School we offer A Levels in both Music (Edexcel) and Music Technology (Edexcel). Students can opt to do either or both of these options, and advice can be given as to the suitability and advisability of doing each course. Christ's School Music hires independent tutors offering high-quality tuition in the full range of instruments, including voice. Numbers in all areas continue to expand. The department is flexible and will aim to provide tuition in areas not previously covered if there is a need. Tuition is currently offered in piano, guitar (classical/jazz/rock/bass guitar), drums, flute, oboe, clarinet/saxophone, brass, singing, violin/viola, cello and double-bass. Individual tuition in the field of music technology may also be an option, although we do run after school clubs for this also. Plenty of opportunities exist at Christ's for extra-curricular music. We generally host two major concerts each year, which give the chance for singers and instrumentalists to exercise their skills on the public stage. In recent years there has been considerable investment in sound and lighting equipment by the school. This has made a big difference to the presentation of major events. A concert at Christ's will typically contain: instrumental solos (classical, jazz, popular); vocal solos in a range of styles; the school choir; a band or orchestra; a variety of ensembles, large and small; rock groups; music technology; dance. We have been gifted with the funding to run free introductory lessons in some instruments. From the same source we were able to purchase a large quantity of new instruments for the department. The department has an open-door policy at lunchtimes and after school, where students can come in and practise. Typically during most lunchtimes all available spaces in the department are being used by students, as well as teacher-directed rehearsals of various instruments and vocal groups. The department is a vibrant place. Musically gifted pupils will be strongly encouraged to join external youth music organisations to supplement what can be achieved in school. A number of students have joined local youth orchestras (such as Ealing, Thames or Stoneleigh Youth Orchestras and the London Schools Symphony Orchestra) and have been encouraged to attend the junior departments of the main London music colleges such as the Royal College of Music. A choral and orchestral concert, featuring Karl Jenkins’ Adiemus, Songs of Sanctuary, and solo performances with orchestra by two of our most advanced instrumentalists (Otto Sterner: Schindler’s List; Patrick Wilson: Arban. Fantasy and Variations on Carnival of Venice for Trumpet and Orchestra; Purcell sonata for trumpet and strings). This highly successful and ambitious concert was presented at St. Matthias Church in Richmond and was part of an ongoing series. An evening of classical guitar by Marc Ongley: part of an occasional series of professional concerts hosted by the music department. Mr. Ongley is a professional guitarist who also teaches at Christ’s School. The study of music is linked to a much wider variety of careers than many people imagine. The presenter James May is one of many broadcasters and presenters who are music graduates; many music graduates pursue careers in law, accounting, etc. as well as arts administration, the media, facilities management and many other similar areas; and there are some who do indeed pursue a career in musical performance, though this is a very hard route and only for the very talented: we do, however have recent Christ’s alumni who have followed this route! Those who continue with post-18 musical study have to choose between music college (conservatoire) and university courses; the former is more practical and geared towards musical performance, and the latter more academic, but still with a lot of practical music making. Currently we have four recent ex-students who are playing in bands professionally, one in the National Youth Jazz Orchestra and three students currently studying music at music colleges with a view to working in the profession. Students can source these directly from Mr Wilson. Mr Wilson recommends YouTube and online music encyclopedias for extended listening and other musical resources.